M T D N o v e m b e r 2 0 1 8 10 N e w s / V i e w s Raben Tire adds store Evansville, Ind.-based Raben Tire Co. LLC has opened a commercial truck and farm tire center in Effingham, Ill. Tire Discounters is No. 1 Tire Discounters Inc. has been named Best Tire Store for the second straight year by the Chattanooga Times Free Press. Nexen honors veterans Nexen Tire America Inc. is partnering with the Purple Heart Foundation in the Ameri- can Muscle for American Heroes program. Nexen will award a custom muscle car equipped with Nexen Roadian HP Street Sport all-season radial tires to a Purple Heart Medal recipient. 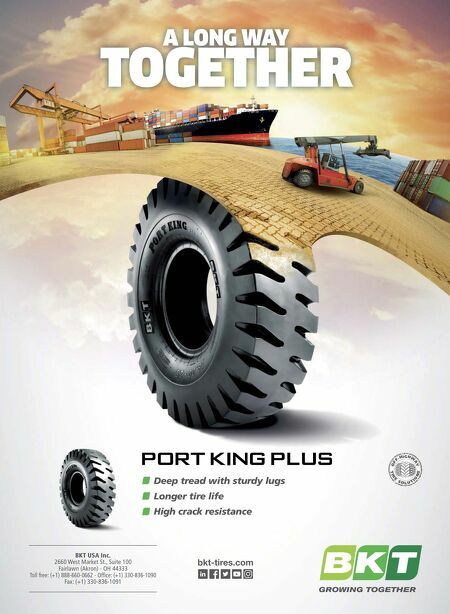 Cooper has a new partner Cooper Tire & Rubber Co. has a new partner for truck and bus radial (TBR) tire production in China. Sailun Jinyu Group Co. Ltd. is acquiring the 35% stake in Cooper Qingdao Tire Co. from Qingdao Yiyuan Investment Co. Ltd. (QYI). Cooper owns the other 65%. Yokohama opens R&D center Yokohama Tire Corp. has opened a tire research and development facility in Corne- lius, N.C. The 25,000-square-foot Yokohama Development Center America will consoli- date R&D staffs from several locations. It is Yokohama's largest overseas R&D center. Monro updates website Monro Inc. says it has modernized its corporate and retail websites, a major mile- stone in the rollout of its customer-centric engagement initiatives and development of an omni-channel presence. Ateq adds sensor Ateq TPMS Tools LC has added the Intel- liSens Universal sensor to its tire pressure management system tool software. The company says users can program sensors of both 315 and 433 frequencies. Ford chooses Apollo Ford Motor Co. has chosen the Vrede- stein Quatrac 5 from Apollo Vredestein BV as a standard fitment on the next gen- eration Ford Fiesta in Europe. Apollo also supplies its Vredestein Sportrac 5 on the Ford EcoSport. Bites More wholesale changes D id you think major changes in the wholesale tire distribution chan- nel were over for this year? ink again. Max Finkelstein Inc. and Treadmaxx Tire Distributors Inc. have formed a whole- sale buying group, Tire Distributors of the Americas LLC. e member-managed venture will leverage the purchasing power of both founding distributors to create, as stated in a joint press release, "advanta- geous partnerships with vendors and suppliers in all aspects of business where symmetries exist among distributors." Areas of cost savings range from equip- ment and supplies to technology and insurance, with a focus on strategic tire manufacturers and proprietary offerings. In January, National Tire Whole- sale, the second largest tire wholesaler in the U.S. behind American Tire Distributors Inc., was created when Michelin North America Inc. purchased 50% of TBC Corp. from Sumitomo Corporation of Americas. e joint venture combined Michelin's more than 85 Tire Centers LLC distribution centers with TBC's 59 Carroll Tire distribution centers. In April, Goodyear Tire & Rubber Co. and Bridgestone Americas Inc. formed TireHub LLC by merging their company-owned wholesale consumer tire distribution networks. TireHub combined Goodyear's 45 wholesale warehouses on the retail side with Bridgestone's 38 Tire Wholesale Warehouse (TWW) warehouses. Max Finkelstein, based in Astoria, N.Y., has 15 distribution centers across the Northeast and Mid-Atlantic. It sells Goodyear, Dunlop, Kelly, Pirelli, Kumho, Falken and Kenda brands, among others. "This new venture allows our two companies and the members of the group to leverage our knowledge and best practices, eliminate redundancy in the supply chain and create greater purchasing power," said Ira Silver, CEO and president of Max Finkelstein. Treadmaxx Tire Distributors, based in Atlanta, delivers tires from 14 warehouses in seven states. It offers Continental, General, Michelin, BFGoodrich, Cooper, Mastercra, Starfire, Roadmaster, Good- year, Dunlop, Kelly, Fierce, Kumho, Ohtsu, Pirelli, Toyo and Carlisle. (Kauffman Tire Inc. sold its 69 retail stores to Mavis Tire Supply Corp. in January to focus on its wholesale distribution business.) "As the tire industry continues to evolve, this will help strengthen the posi- tions of all the members by leveraging best practices… which, in turn, will create a better value proposition for the indepen- dent tire dealer," said Mark Kauffman, CEO and president of Treadmaxx. Max Finkelstein and Treadmaxx oper- ate 29 regional tire distribution centers in 16 states, which cover the Eastern seaboard and South-Central regions of the U.S. Tire Distributors of the Americas is structured as a strategic membership group, with opportunities for additional members. Silver and Kauffman are co- presidents. Sean Franciscus, director of supply chain for Max Finkelstein, is secretary. Brian Rose, vice president of purchasing and pricing for Treadmaxx, is treasurer. 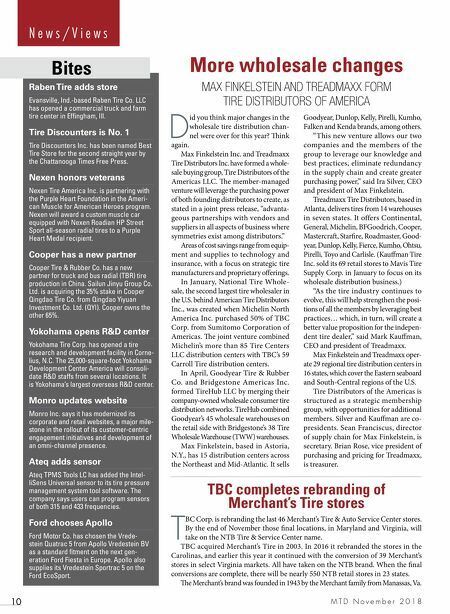 MAX FINKELSTEIN AND TREADMAXX FORM TIRE DISTRIBUTORS OF AMERICA TBC completes rebranding of Merchant's Tire stores T BC Corp. is rebranding the last 46 Merchant's Tire & Auto Service Center stores. By the end of November those final locations, in Maryland and Virginia, will take on the NTB Tire & Service Center name. TBC acquired Merchant's Tire in 2003. In 2016 it rebranded the stores in the Carolinas, and earlier this year it continued with the conversion of 39 Merchant's stores in select Virginia markets. All have taken on the NTB brand. When the final conversions are complete, there will be nearly 550 NTB retail stores in 23 states. e Merchant's brand was founded in 1943 by the Merchant family from Manassas, Va.